The Dharma Chip & Dip adds a reflective beauty to the pleasures of snacking. 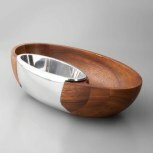 Beautifully balanced, the piece combines a sensuous wooden bowl for chips or crudites with a gleaming inset alloy vessel for fresh salsa or aioli. Intelligent craftsmanship makes the piece easy to use and clean, and its tilted axis creates beautiful presentation.